Apprentice lineman J.D. 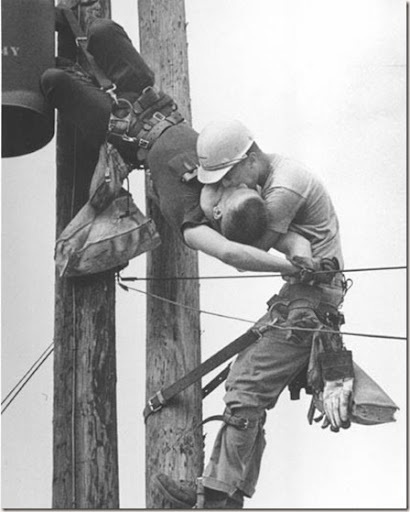 Thompson is breathing life into the mouth of another apprentice lineman, Randall G. Champion, who hangs unconscious after receiving a jolt of high voltage. Morabito was driving on West 26th Street in July 1967 on another assignment when he saw Champion dangling from the pole. He called an ambulance and grabbed his camera. I published this post once before, over a year ago, but it is still a favorite photo of mine (and so is the story). I thought that it was worth posting again. This entry was posted on Wednesday, March 28th, 2012 at 7:00 am	and posted in Photography. You can follow any responses to this entry through the RSS 2.0 feed. I remember this either from this site or another…no matter where I saw it the first time, it is good to see it again! !